Our Perfectly Imperfect Life: Love Unending | How can I remember how to be a wife when it takes all I’ve got to be a momma? 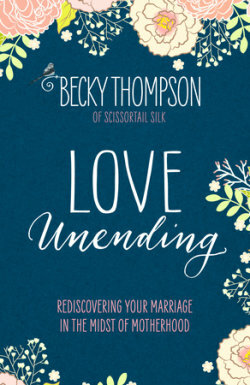 Love Unending | How can I remember how to be a wife when it takes all I’ve got to be a momma? Since becoming a mom, do you ever feel like your marriage no longer receives the attention it needs to thrive? Do you ever struggle to balance your roles of being both a momma and a wife? Do you ever wonder how you’re supposed to re-center your heart on your husband when you are so busy with everything else? Those feelings we experienced in the first days of love and marriage often become buried beneath hurried life, active children, and mountains of bills and laundry. We wonder where the romance went when kids became a part of our love story. Maybe you’ve questioned and perhaps even worried if you’ll ever again experience love as you did in the beginning—that newness of what it meant to be fully caught up in one another. But what if you could rekindle that fresh sort of love? What if there was a secret to love unending? Let Love Unending guide you step by step as you realize that sometimes the best way forward is to go back to the beginning. This book was just what I needed to read. I don't think anyone could have prepared me for how much motherhood would change me as well as my marriage. My Husband just celebrated our 8th wedding anniversary last week. This book covers the changes that come during the season of Motherhood and tells you how to best handle it and to not put your spouse on the back burner. This book is full of humor and wit, is a 21-day journey helps bring some spark back into your marriage, helps you to remember what made you fall in love with your husband and focus on that.